Victim of the assault by guards still suffering from injuries received during the beating, according to his written statement obtained by CRI. 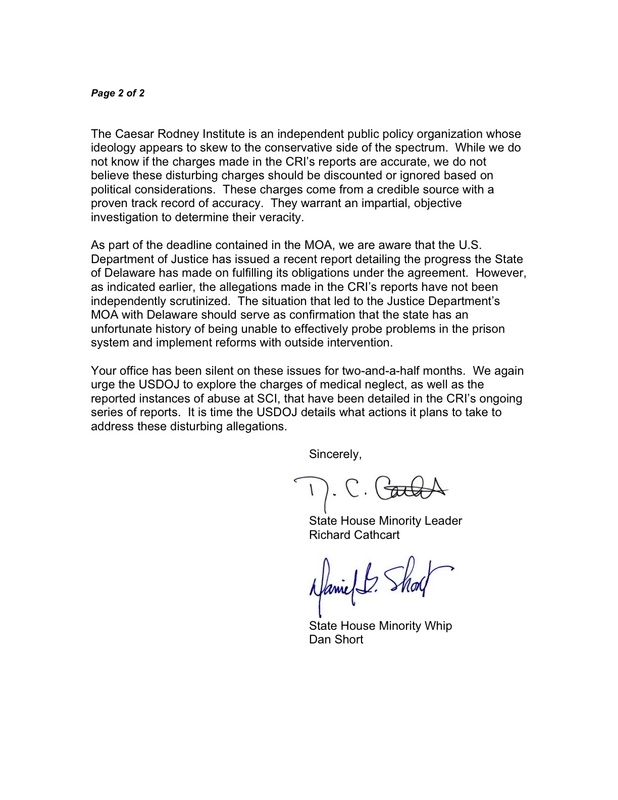 After 42 inmates at the Sussex Correctional Institution in Georgetown came forward telling state officials they witnessed an unprovoked assault by three guards on one inmate – an attack they claim was started by the guards – retaliation has begun against the whistleblowers. The inmates documented the assault on a Department of Correction (DOC) grievance form, which bears their 42 signatures. It was sent to Attorney General Beau Biden, Correction Commissioner Carl Danberg, the American Civil Liberties Union of Delaware, the NAACP and Dover attorney Steve Hampton. They specifically asked Biden and Danberg to shield them from retaliation from the guards, who remain assigned to the tier. Dickerson’s statement of the events provides more detail. Both complaints allege that the guards verbally provoked the assault, which began with an exchange of words. In his statement, Dickerson said a guard sergeant “grabbed me by the head and pushed me into the chow hall. Then he quickly tried to slam me to the ground, but I ended up falling on top of him. At that point, I knew he was trying to hurt me, so I held him on the ground with one arm close to his body, so that he couldn’t do nothing to me. “Seconds later, one officer who I cannot identify because he came from behind me, put me in a choke hold an began choking me while the other officer began punching me in the face. That’s when I let Sgt. [name withheld by CRI] go, closed my eyes and they continued to punch and choke me until I was either knocked out by a punch or until I passed out from lack of oxygen, because I was choked so long. I cannot say which it was, because I was being choked and punched at the same time. He strongly denies fighting back during the assault. Dickerson filed grievances about the assault, sick call requests for medical aid, and asked to have his battered face photographed. He claims to suffer from constant headaches and broken blood vessels in his eyes. Acquaintances of the inmates who reported the assault say staff has started to retaliate against the 42 whistleblowers. The retaliation ranges in severity from the minor – making an inmate dump his food tray before he has had a chance to eat – to the serious. One inmate, CRI was told, was watching a football game Sunday. He did not hear the guards announce a head count, and remained behind. The guards threatened to charge him with attempted escape, which could add years to his sentence. The DOC is also trying to suppress more information about the assault from leaking out of the prison. 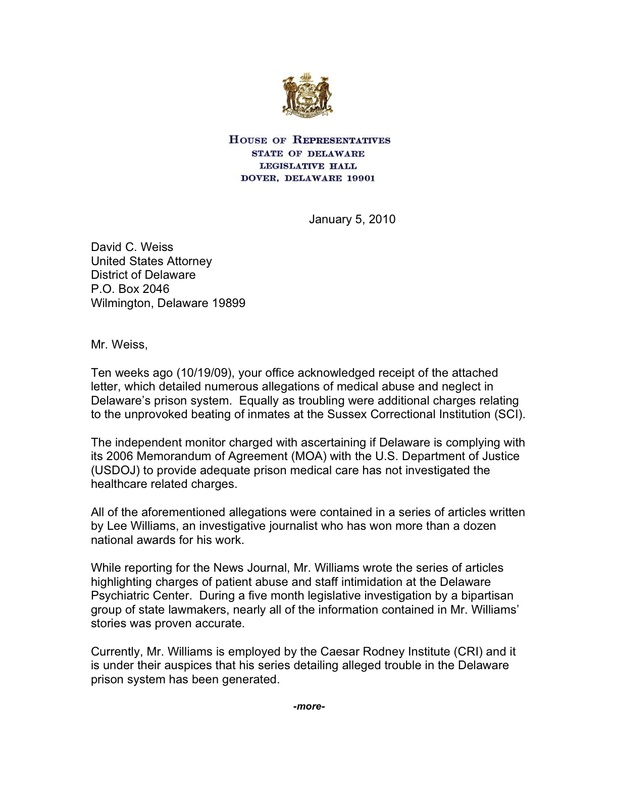 The Caesar Rodney Institute has learned that a Delaware news reporter requested to interview three of the 42 inmates who witnessed the assault. Tuesday evening, CRI has learned, the DOC’s internal affairs investigators pulled the three inmates whom the reporter sought to interview from their cells and interrogated them about Dickerson’s assault. Department of Correction Commissioner Carl Danberg did not return calls seeking comment for this story. Danberg has said the investigation into Dickerson’s assault will take months. SCI has a reputation for abuse, especially if the inmate is small, non-threatening and mentally or physically ill.
Dickerson stands 5-foot, 4-inches, suffers from severe asthma and weights 130 pounds. In June, guards at the facility nearly beat Laurel businessman David Sully to death, by raining down blows to his head and face. Several wounds on Sully’s face required stitches to close. When he left the facility, he was covered with dye used in the guards’ pepper spray. Despite horrific photos that chronicled the assault, Danberg said his guards did nothing wrong. He implied Sully had done something to merit the repeated beatings. Sully is 5-feet, 5-inches tall and weighs 140 pounds. Last month, Gianfranco Carta said guards at SCI shot pepper spray directly into his mouth, and then smacked his head into a concrete wall several times as he walked blindly down a hallway. Carta stands 5-feet, 7-inches and weighs 140 pounds. In 2006, several guards attacked inmate David Kalm. Sometime during the assault, one of the guards shoved a nightstick or similar object down Kalm’s throat, tearing his trachea. Kalm is 5-feet, 7-inches and suffers from asthma, COPD and severe anxiety. Danberg’s internal affairs unit investigated and found the guards did nothing wrong. Kalm has since sued the DOC. His case is pending. The guards – defendants in the civil suit – are represented by the Attorney General’s office, after the office concluded they did nothing to merit criminal charges. Witnesses ask Attorney General Beau Biden, Correction Commissioner Carl Danberg, ACLU, NAACP to protect them from abuse and retaliation. An entire tier – 42 inmates – at the Sussex Correctional Institution in Georgetown has come forward telling state officials they witnessed an unprovoked assault by three guards on one inmate – an attack which they say was started by the guards. The 42 whistle-blowers claim physical assaults, taunts and intimidation by guards on SCI’s Medium Security Building’s “A” tier are a daily occurrence. They documented the assault on a Department of Correction (DOC) grievance form, which bears their 42 signatures. It was sent to Attorney General Beau Biden, Correction Commissioner Carl Danberg, the American Civil Liberties Union of Delaware, the NAACP and Dover attorney Steve Hampton. “We the inmates fear these two officers, and request that they be moved out of the building, that they do not retaliate against the inmates for writing this petition and the grievance that they have filed concerning this incident,” the grievance states. Neither Danberg nor Biden were willing to be interviewed for this story, or say whether they would protect the inmates from retaliation for coming forward. SCI Deputy Warden G.R. Johnson was similarly certain the assault was being investigated. However, Johnson admitted he hadn’t seen the inmates’ grievance or any document ordering an inquiry. Dover attorney Steve Hampton has seen the results of numerous investigations by the DOC’s internal affairs unit. Few have resulted in discipline or charges. Hampton pointed out that even if an IA investigation finds malfeasance or criminality, the investigators have no authority to prosecute the cases. The bigger problem, Hampton said, is the “Culture of Silence” at SCI, also known as the “Blue Wall.” Guards at SCI, he said, will not report the misdeeds of their peers. Danberg’s internal affairs unit investigated and found the guards did nothing wrong. Kalm has since sued the DOC. His case is pending. The guards – defendants in the civil suit – are represented by the Attorney General’s office, after the office concluded they did nothing to merit criminal charges.